Book Review Magnum Photobook: The Catalogue Raisonné. By Carole Naggar and Fred Ritchin Reviewed by Blake Andrews The current photobook renaissance has been ongoing for more than a decade now. So it was perhaps inevitable that at some point its head would begin eating its tail. Magnum Photobook: The Catalogue Raisonne. By Carole Naggar and Fred Ritchin. Phaidon Press, 2016. Text by Carole Naggar and Fred Ritchin. Phaidon Press, London, England, 2016. In English. 272 pp., 1500 color & 100 black-and-white illustrations, 8½x11¾x1¼". The current photobook renaissance has been ongoing for more than a decade now. So it was perhaps inevitable that at some point its head would begin eating its tail. Judging by several recent compilations, we're now well into that meta realm. Photobooks about photobooks have become fairly common. In the current millennium, there have been all sorts, from Roth's The Book of 101 Books to the three Parr/Badger volumes to Errata Editions' photobook facsimiles. There is a photobook for Dutch photobooks, one for Japanese photobooks, one for Chinese photobooks, and one for Latin America. At this rate, there will soon be one covering each country, and we'll need a catalogue raisonné to track all of the photobooks about photobooks. Magnum Photobook: The Catalogue Raisonne. By Carole Naggar and Fred Ritchin. Phaidon Press, 2016. Such a book may eventually happen but we're not there yet. In the meantime, publishers can tackle the task of comprehensive annotation in small chunks. Or large chunks, as the case may be with Magnum Photos. Now in its seventieth year, Magnum is a titan in the world of documentary photography, representing luminaries such as Cartier-Bresson, Erwitt, and Koudelka. Collectively its members have published over a thousand photobooks. Why there's enough material for a photobook about their photobooks. Into the breach step Fred Ritchin and Carole Naggar with Magnum Photobook: The Catalogue Raisonné. As the title suggests, the book systematically annotates every single photobook by Magnum authors. That's right, Every. Single. One. 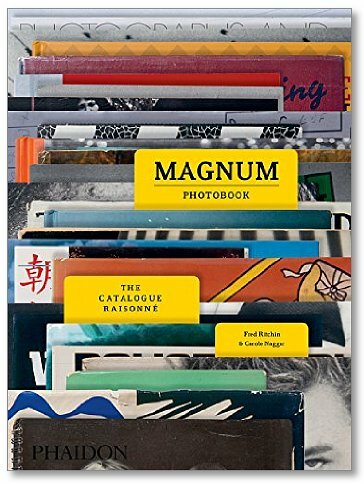 There is also a large section profiling selected photobooks in depth, and a brief chapter Making Photobooks with short example-based contributions from Magnum photographers. We'll get to those in a moment. But first let me discuss the working engine of this book, which is the comprehensive listing of all Magnum photobooks: the catalogue raisonné. The books are listed by author, each one with a small icon of the cover and publishing information. It's not a lot of information per book, but when taken as a whole the scope of this project is mammoth. The cataloging —in microscopic font— consumes over fifty pages of the book's last chapter. For librarians, archivists, photobook collectors, Magnum buffs, and anyone else in need of a definitive publishing record this section of the book alone is worth its weight in 4 pt lead type. There is nothing else like it that I know of. Interspersed between the comprehensive index and Fred Ritchin's oddly dispassionate introductory text, The Catalogue Raisonné is filled out with two other sections. The primary body of the book is The Photobooks: In Detail 1938 - 2016. This section follows the now familiar format pioneered by Roth, Parr/Badger, and other photobooks on photobooks mentioned above. A facsimile of the book's cover is spliced into an attractive layout with a few interior spreads and a brief written analysis. The images are scanned from original copies with yellowing pages, scuff marks, grease stains, and shadows, inferring them with book-like tangibility. You almost feel you could lift the books off the page and hold them. Note, the In Detail section does not list every book by Magnum authors. That's the job of the comprehensive index. Instead, the selections highlight well-known Magnum photobooks in depth, no more than one per author. They are sequenced chronologically from Capa's Death In The Making (published in 1938, before Magnum was established) to Michael Christopher Brown's Libyan Sugar published just last year. In between is a heavy smattering of the usual suspects, along with several titles which will be new to most. The texts (primarily written by Naggar) give a nice overview of each photo book. For those hungry for more, eight of the books are expanded on further in the brief middle section Making Photobooks. In this chapter, the original Magnum authors write from first-hand experience about how their photobooks were made, illustrated with early drafts, notes, and ephemera. This is a fascinating section but unfortunately not very long. It's the briefest chapter at just fifteen pages. BLAKE ANDREWS is a photographer based in Eugene, OR. He writes about photography at blakeandrews.blogspot.com.